Recently we hosted a movie viewing and discussion on the film “Poverty, Inc.”--a relevant film for our third world development work. It exposes the detrimental effects of long-lasting of humanitarian aid “gifted” to the third world, to the effect that actually drives local entrepreneurs out of business because “you can’t compete with free.” The film gives testimonies from hard-working, innovative individuals who make everything from solar powered light poles to locally-sourced shoes and clothing. Then, the same individuals explain what happens when a well-meaning charity arrives (and never on a predictable schedule)—community members take what is freely given, perpetuating the real need that very few aid groups are focusing on: employment. The onslaught of aid that floods in, even after natural disasters have subsided, have created a new unnatural disaster. As a result, an entire generation of people who no longer work to solve the problems life has presented them. They simply accept the handout. After all, it's free. As a development agency working in East Africa, the film didn’t necessarily teach our organization things we don’t already know, but it did confirm that our experience is not the exception, but the norm. While we do feed, clothe, and educate the poor when we are met with their situation and have the capacity to do so, it is not our sole mission. And while we feel really good about providing a pair of shoes, or a scholarship, or a well, there is nothing that quite compares to the light in a father’s eyes when he realizes that he possesses a skill that can provide for his own child’s school fees, or that he can finish his house. True development work (as opposed to relief work) focuses on the human being, and that focus demands that we find ways for them to provide for themselves with dignity. This is why you’ll hear our organization focusing so much on job creation, and not just meeting people’s basic needs ourselves. If you look at how often Jesus talks about labor, you can see that it was a major part of his ministry as well. Once in awhile, we are blessed to work with other organizations who have this same concern for sustainable job creation in mind. Together, we can accomplish more than we would apart. Cameron Kagay, lead manager of the East Africa regional team, along with immersion participants interested in textiles and health care, visited the AFRIpads headquarters and sat with leaders of their nonprofit. Though this effort was helpful for a few families, the need went beyond that. When we began working with St. John’s Primary school, menstrual pads were one of the main things they requested we help them to obtain (among other things like clean water, a repaired roof, and teacher training). We didn’t have the facility, manpower, or time to create all the pads that were needed to help all of the girls in need of pads, nor did all of their mothers have the time to devote to the project. Fortunately, we found someone who did: AFRIpads. AFRIpads is a “social business that specializes in the local manufacture of cost-effective, reusable sanitary pads.” But it’s not only local and cost-effective, it’s sustainable. AFRIpads employs 150 Ugandan women with meaningful work that benefits their families without depending on the West. Their company provides meaningful work for hundreds of African women and has supplied pads to 750,000 girls across Africa. Since meeting AFRIpads, we have toured their headquarters and met with their leaders. We have lead interns and immersion participants through meetings with the company, showcasing the benefit of sustainability. We also purchased enough pads to supply each of the girls from P4-P7 with their own supply--something we wouldn't have been able to do were it not for their product, which packs four pads and a carrying purse for $4. This year, each of the girls aged fourth grade and up at St. John's Primary received their own supply of reusable sanitary pads--a gift that does more than meet a need, it also keeps them in school. This kind of collaboration is what is necessary for true development to occur--partners in sustainability, each doing what they can to educate and empower locals to meet their own needs. We’re thankful we are not the only ones working towards this necessary end. We are grateful for companies like AFRIpads who are making a wonderful difference in Uganda, by instilling dignity through meaningful work. 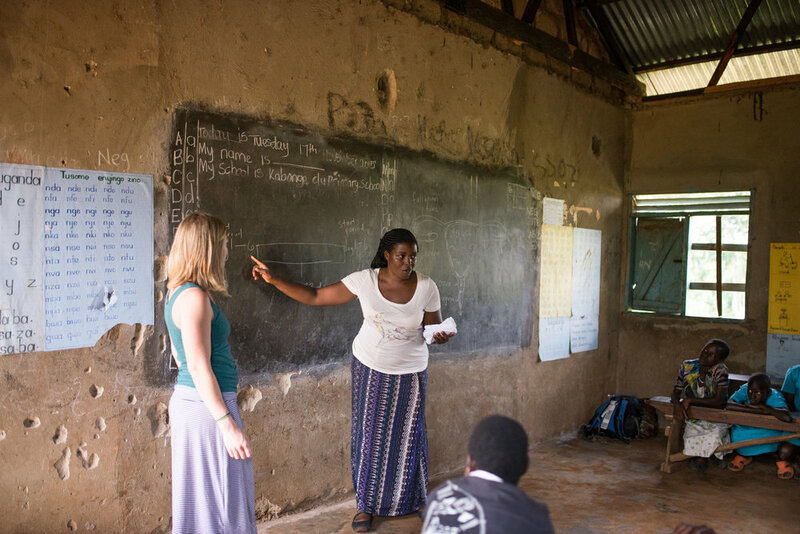 Christina James, East Africa Immersion participant with an emphasis in Health Care, teaches about women's reproductive health alongside Josephine Ssemakula, teacher at St. John's and G.O.D. EA Cooperative.